The Korean Meteorological Administration (KMA) is the governmental agency responsible for weather forecasting and managing meteorological data in South Korea. As part of this responsibility, the KMA runs networks with a total of about 500 weather stations. 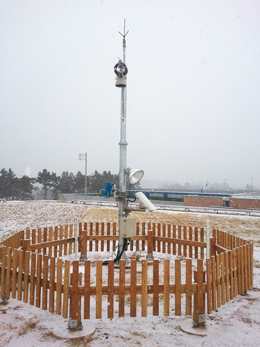 Among other sensors, the stations include precipitation gages and ranging sensors to measure snow depth. In recent years, the KMA has been researching how to get better precipitation and snow depth data than they do with traditional tipping-bucket rain gages. As part of this research, the KMA compared and selected a variety of weight-sensing gages, sonic-ranging sensors, and laser-ranging sensors manufactured by various companies all over the world. The KMA also set up a new area for objectively testing and comparing sensor performance. Since the sensors’ output signals are as varied as their manufacturers, the KMA needed dataloggers capable of reading any type of signal the sensors might send. The KMA chose Campbell Scientific dataloggers because they can read all of the different signals that come from these sensors. Two CR3000 dataloggers and three CR1000 dataloggers are used to read analog voltages, as well as RS-232, RS-485, SDI-12, switch-closure pulse, and high-frequency pulse signals. The PakBus network protocol is applied to reduce the number of communication lines between dataloggers and the data-collecting PC, which is 500 m away in the office. One of the stations has a CR3000 and a CR1000 in the same enclosure. In this case, the CR1000 sends its data to the CR3000, which sends all the data to the PC. This allows for a single communication line, reducing costs and making management of the data easier because one file is generated from two loggers. This project will benefit greatly from the compatibility and reliability of the dataloggers. The KMA is running this test through the winter and hopes the data will help them choose the best precipitation sensing equipment for their nationwide networks. K. H. Hong, B&P International Co., Ltd.